In the interview below, highly regarded Canadian artist Allan Harding McKay explains why he is destroying his work in Ottawa tomorrow. 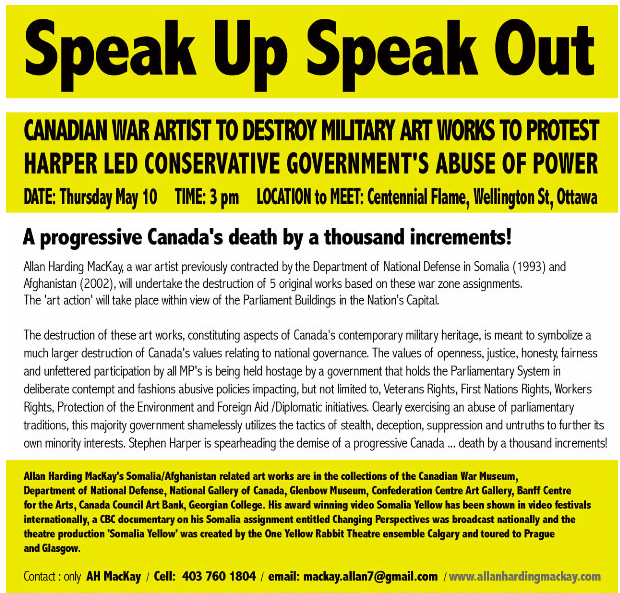 MacKay plans to destroy four more of his works pieces on Parliament Hill on Thursday. May 10th and says he hopes his act will help more people “wake up” to how the government is doing business. As an artist, I applaude and support Mr. MacKay for his art action and thank him for standing up and speaking out on what he believes in. The erosion of our democracy is happening by tiny increments. Who else, but the artist to help draw attention to matters of concern for everyone. Thank you, Allan. And thank you for emailing me back and encouraging everyone to Speak Up and Speak Out. You can read more and get the facts straight about Allan on his website at Allan Harding MacKay . You can email Allan at Mackay.allan7@gmail.com or even better, if you are in the Ottawa area, meet at the Centennial Flame on Wellington Street in Ottawa and support him in person. Find your voice. Use it.